One Direction Our Moment is a gentle, youth, floral fruity fragrance. One Direction Our Moment 100ml. Eau De Parfum - Fruity and floral for women Parfum One Direction Our Moment, whose name betrays forming region. It's a boy band One Direction, who offered his essential irresistible adventure that is full of fresh spicy and woody base. One Direction Our Moment's Parfum, with which you will taste the acidity of many ingredients, but also the floral sweetness of intoxication. Combination of grapefruit, red currant, jasmine and freesia. Folders that will make you and make you a wild lady who does not hide feminine sensuality. Female tuning is also reflected in the processing pink flacon. 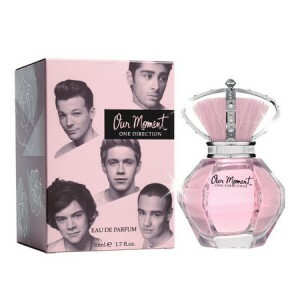 Parfum One Direction Our Moment has a very distinctive shape, as well as cap-style crown. You too can become queen of the night and enjoy the fragrant haze around him. Essence with which you certainly will not get lost. According One Direction group fragrance is designed, of course, primarily for young fans of the pop group consisting of young men. The smell of the fragrance reflects the light of a sunny day, the bottle design done in pink and has a comical royal symbol in the form of cap with a crown. The fragrance opens with notes: sour fruit notes of red currant, wild berries, pink grapefruit in the top notes, a bouquet of freesia, jasmine and frangipani in the heart and musk, woody notes of patchouli and white in the loop.